A cozy winter drink perfect for evenings at home curled up with a good book or the latest Netflix binge – The Lemon Berry Tea Hot Toddy! Anyone else dreaming of fireside snuggles cozied up with your handsome honey or frankly a good book just might do? 😉 Yes? 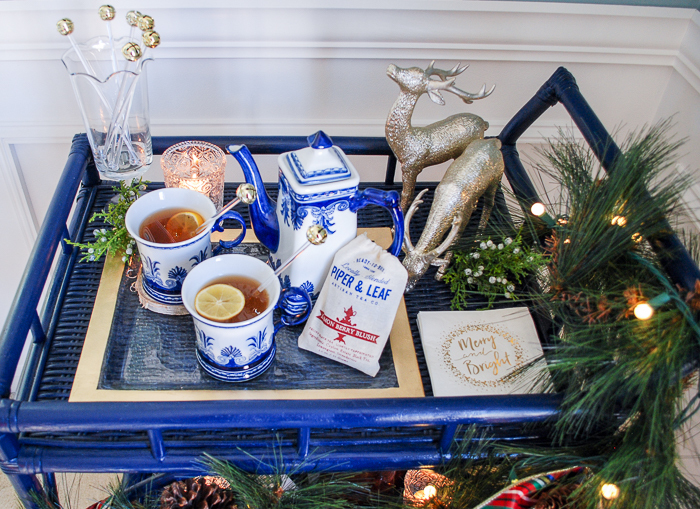 Well then I’ve got the perfect winter cocktail for you – a lemon berry tea hot toddy. It is the perfect flavorful and fragrant drink to indulge in this winter on those cold blustery evenings at home. Sore throat not required! 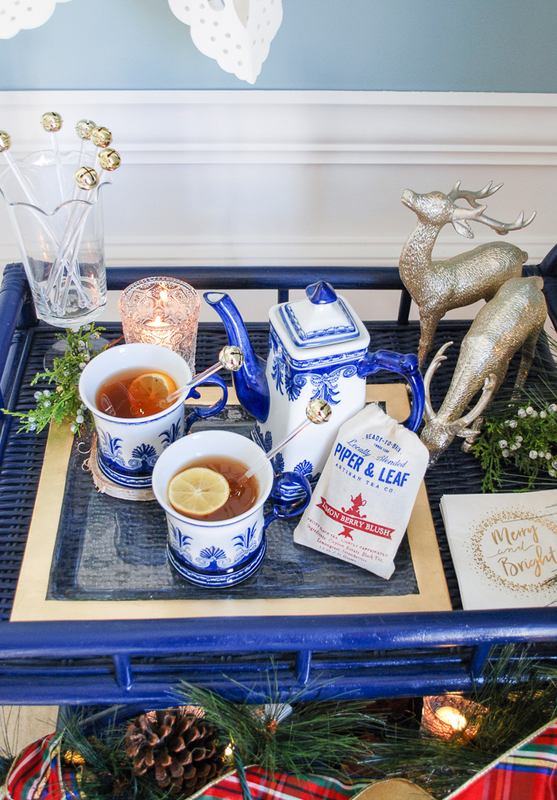 My tea hot toddy blends this lovely lemon berry blush tea from Piper & Leaf with bourbon, lemon juice, honey, and amaretto. It is a soothing drink neither too sweet nor too tart. Slice in a lemon wedge for garnish and a fun holiday stirrer like these jingle bell sticks. If you enjoy a strong cuppa, allow plenty of time for your tea to steep, and don’t forget to use a strainer as this tea is loose leaf. Make the tea first to allow it to steep. Boil your kettle of water. Run hot water from the tap through your ceramic teapot to heat it up and allow it to sit with hot water in it for a few moments. Empty it and add your loose leaf tea. For a 30 oz teapot put 3-4 teaspoons of loose leaf tea in the bottom. Once the water boils, add it to the teapot and steep. In the mugs, pour 2 ounces of Bourbon, 1 ounce of Amaretto, 1 teaspoon of lemon juice, and 1 tablespoon of honey in each. Stir together with a spoon. Once your tea has steeped 5 to 10 minutes (depending on how strong you like it), pour it through a tea strainer into each mug. Stir together and make sure the honey melts. Add a lemon slice for garnish. Get the fire going. 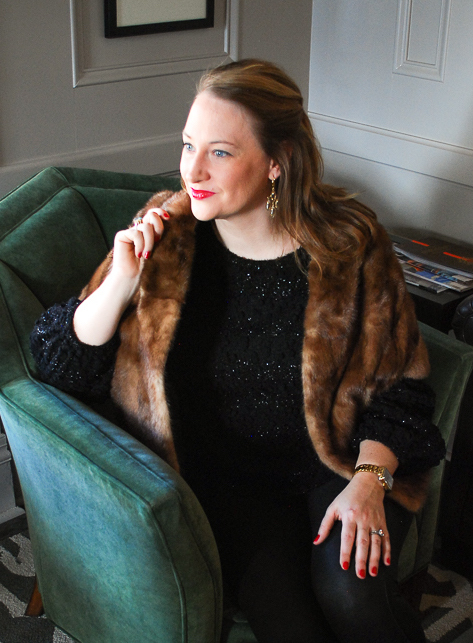 Wrap up in a cozy throw. 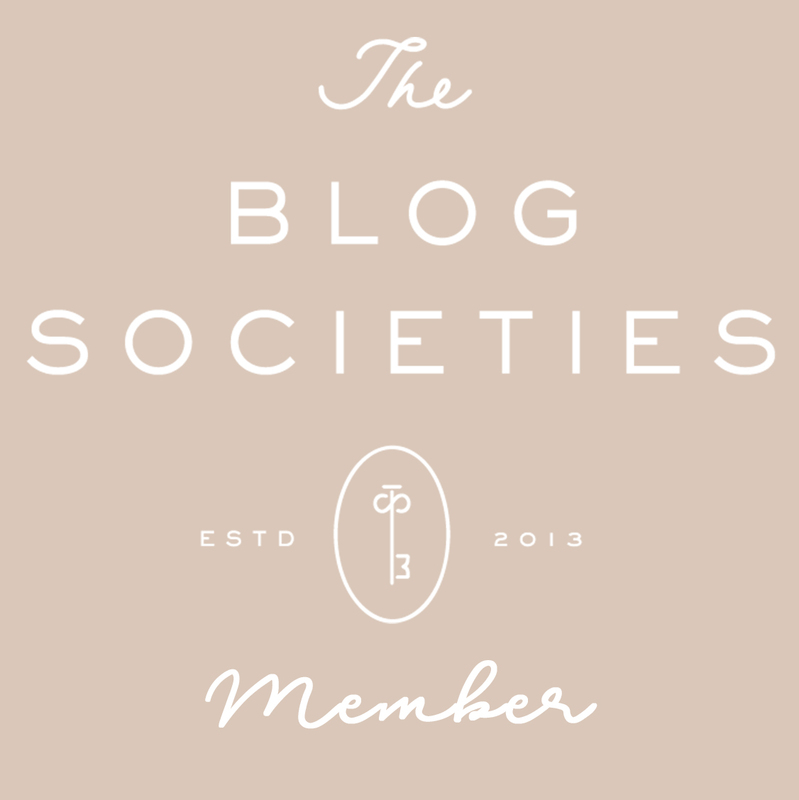 Grab that delicious book or beau…or flick on that binge worthy show and settle in for a lovely evening at home! 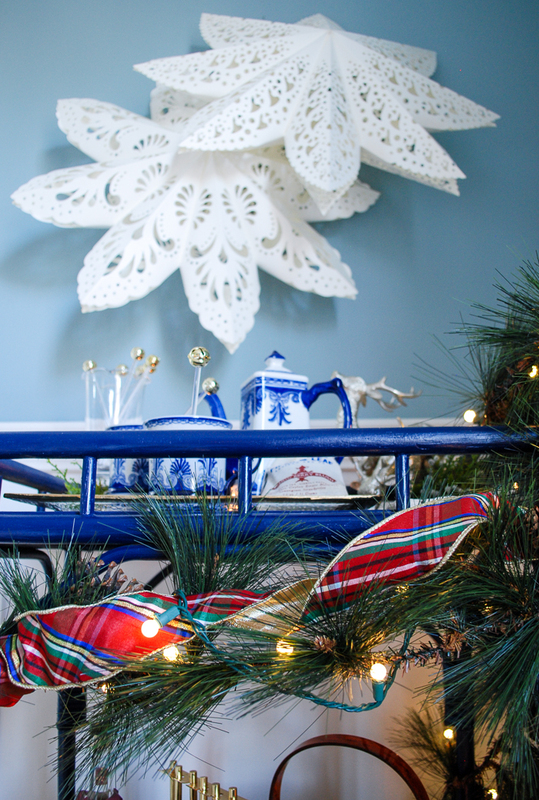 You may have noticed that my Christmas decor this year re-embraced festive plaid in all its glory. 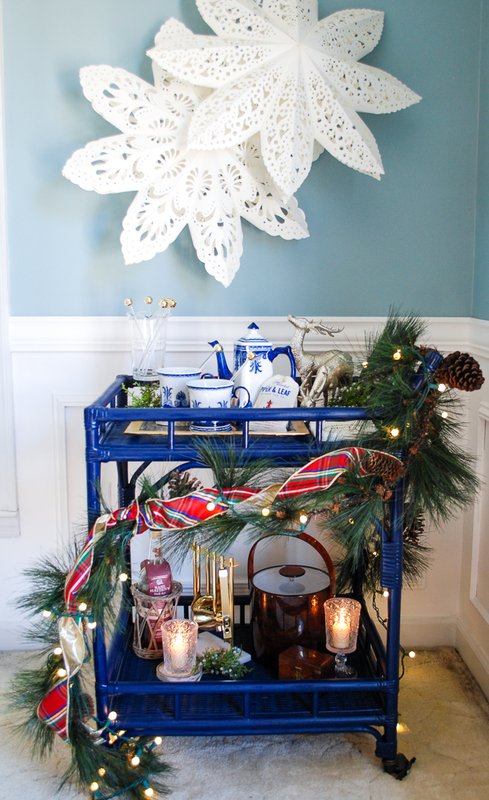 My rattan bar cart simply couldn’t be left un-festooned! 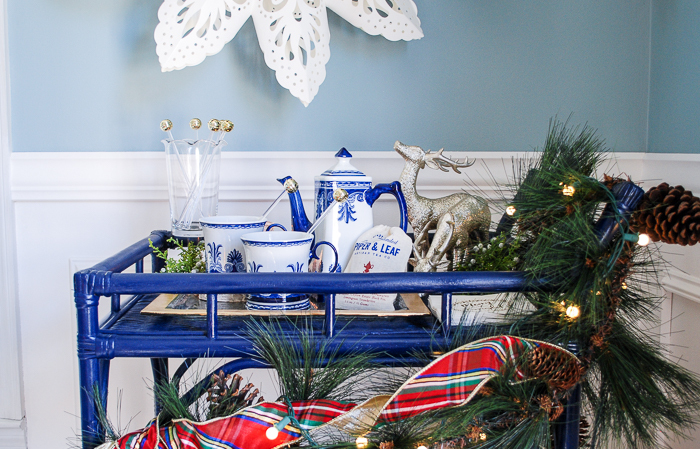 I mixed a lovely faux pine garland, twinkle lights, and my D. Stephens plaid ribbon in a swag across and around the bar cart for a merry look. Above the cart I hung these beautiful cut paper snowflakes I found at World Market and added other little festive touches here and there with the glittery reindeer and juniper sprigs. 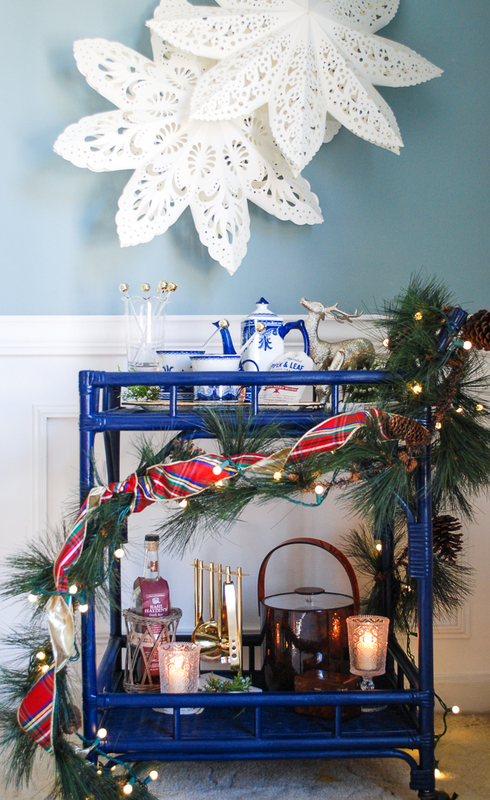 The thing to remember about a holiday bar cart is you want it to be festive and decorated but also functional. Be sure to leave room for your bar tools and accessories. 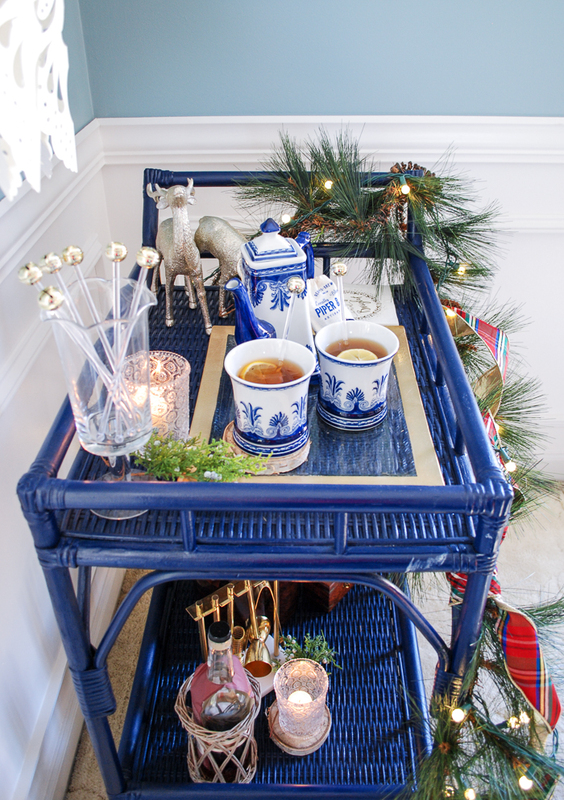 If you haven’t seen how I transformed this bar cart from a dingy brown to this beautifully bold blue, check out this DIY post! Oh! Aren’t these jingle bell stirrers darling? They are almost too big for these mugs, but I simply couldn’t resist using them. I hope you enjoy a nice cuppa of this lemon berry tea hot toddy on a cold winter’s night! Snuggle, drink, and be merry y’all!